Millifiori designs are so much fun! Download the border instructions here. Yet no time to piece? with the illusion of 19 hexagons put together? Hexagons are the coolest shape! I love playing with the nesting and rotating. 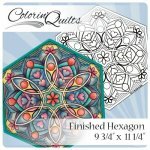 Take Hexagons to the next level with some fun coloring mats. 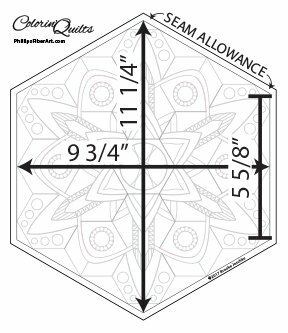 Color, quilt, and use for a candle mat or extend with fabric for any number of uses! Latest Phillips Fiber Art Product!! 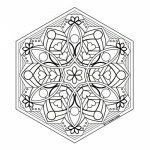 Do you enjoy coloring books geared for adults? Me too! They're so much fun! pairing Phillips Fiber Art with Brooke's screen printing company. Finished Size: 9 3/4" x 11 1/4"
The solid outline around and against the design is the finished size. 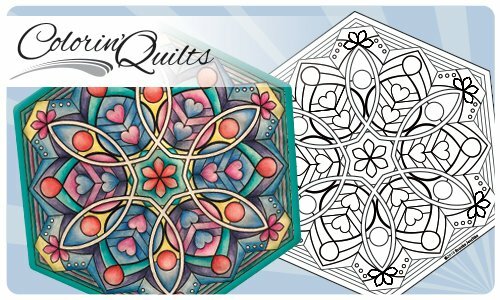 The outer line (outside the main design) is the 1/4" seam allowance which will be covered up by the binding or hidden by the fabric border or block next to it. I suggest you also color into that area because seams aren't always perfect. See the diagram above. Enjoy a little down time!